Meet your neighbor Julie Garrison, who teaches fourth grade at La Harpe Elementary. Julie was born and raised in Quincy. Julie's father is deceased and her mother Hilda Spidle lives in Quincy. Hilda is a school crossing guard for St. Dominic's School in Quincy. Although Julie is an only child she has a large family. Her mother Hilda was one of 20 children, Julie has 10 aunts, 9 uncles and hundreds of cousins. All of Julie's grand-parents are deceased. Julie graduated from Quincy Senior High School. She then attended Quincy University. She graduated in 1998 with a Bachelor's degree in Elementary Education. She also has endorsements in middle school science and social studies. 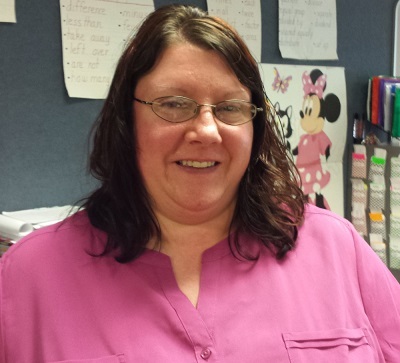 Before teaching at La Harpe, Julie worked at Dallas City Elementary in the Title Room. She has also taught 1st grade and subbed for various school districts. On August 18, 2001 Julie married Wayne Garrison. Wayne works at Martini's in Burlington, IA. Julie has 2 children. Her son Bret, is 9. He is in the 3rd grade at La Harpe Elementary. Bret is invovlved in Boy Scouts. Julie's daughter Jaylie is 7. She is in 2nd grade at La Harpe Elementary. Jaylie is in girls scouts and plays in the summer ball league. Julie attends Sacred Heart Church in Dallas City. She enjoys reading and collecting Mickey Mouse stuff. She also enjoys spending time with her family. Julie and her family usually go to the St. Louis Zoo every summer. In the future Julie would like to continue her education by getting her reading endorsement. Julie's motto for life comes from Walt Disney. "All our dreams can come true, if we have the courage to pursue them."